Thank goodness it's the weekend! Glad to have a day to recover after a crazy week, but it starts again tomorrow since we're hosting Easter dinner for our families. The weather here the past couple days has been beautiful (almost 50 degrees, finally!) which is giving me a bit of spring fever! I can't wait for the snow to melt. Speaking of spring, my most recent stash addition is so perfect for the season! This is Clementine by Dear Stella. So many awesome prints in this line! I especially love those cute little birdhouses and the large scale floral. The chevrons are pretty great too! I'm in the process of sewing up a quilt with these now, which will be displayed in the Dear Stella booth at Quilt Market! Fun! I hope to share some of my progress with you soon. In case you are in the shopping mood today, I've got some sales for you! Pink Castle Fabrics is doing a flash sale of sorts, get 20% off of everything with the code SPRING20 (not sure how long the coupon will stay on, so don't wait if you've got some things in your cart!). Brenda also has a bunch of $6 voile right now, which means its actually $4.80 if you use the coupon too! There are also a ton of great collections like Flea Market Fancy, Loulouthi, and Hope Valley on sale. Stash Fabrics is having a spring cleaning sale, including some great lines like Simply Color, Field Study, and Lucky Penny! Save 20 - 50% off in the sale section. Quilt Sandwich just received some new Alexander Henry prints, including a couple I've been coveting from their Mecca for Modern collection. I just love that Urban Garden print. I also want the scallop print from Maritime Modern, what a great spin on the chevron! Check out the sale section too while you're there. Little Pink Rose is offering 20% off all precuts and bundles this weekend, which includes Textures, Luxe in Bloom, and those Riley Blake Chevrons. Shipping is free when you spend $150, and only $6 for any other order. ChristaQuilts has Line Dance by Kaffe Fassett for 20% off this week, and a huge Clearance section including tons of Amy Butler prints and patterns. Shipping is always free in the US and 20% off internationally. 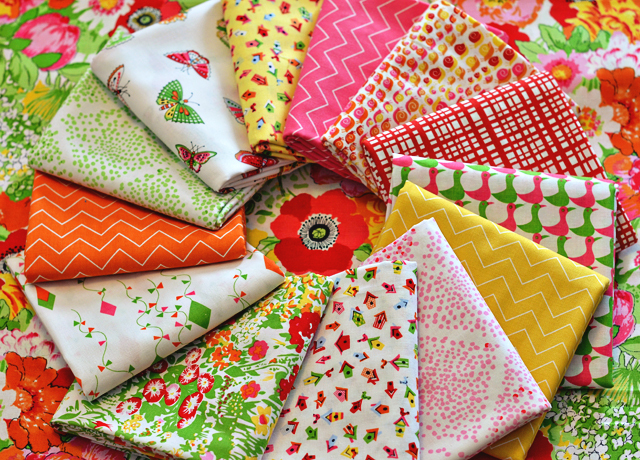 Fat Quarter Shop has a ton of good stuff in their sale section, like Sew Stitchy and Chicopee for $5.38/yd. There are a bunch of great patterns and books on sale too, including Pillow Pop! weird, i have a bit of very old fabric from my mother-in-law's stash that is *exactly* like that birdhouse fabric, with just slightly different colors. i'll instagram it, it's uncanny. Oooh, I like those little dots in the shape of diamonds! These fabrics are just like spring. I can see Rita making some wonderful quilts with this line. I think I am going to get some too! 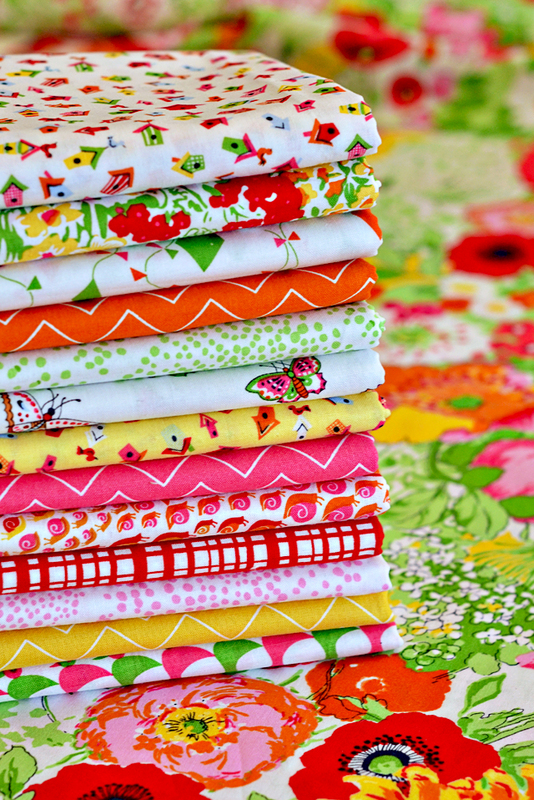 What a lovely stack of fabrics!